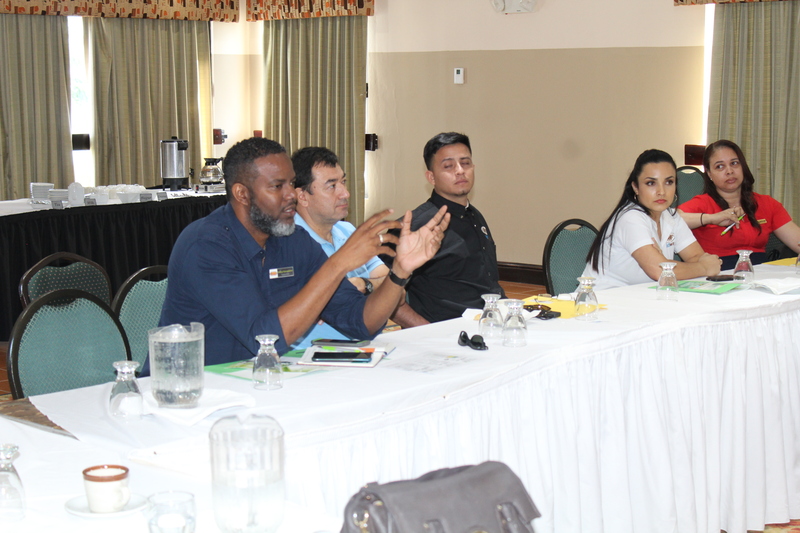 The Belize Bureau of Standards (BBS) in collaboration with the Ministry of Public Service, Energy and Public Utilities and the CARICOM Regional Organization for Standards and Quality (CROSQ) hosted an awareness session for the Implementation of Energy Efficiency Labelling Scheme under the Renewable Energy and Energy Efficiency (R3E) Project on Friday, November 2, 2018 at the Radisson Fort George Hotel and Marina with both Regulators and Importers/Retailers of (Air Conditioners, Refrigerators and Lighting). The session entitled, “Protection of the Consumer – Support the Energy Labelling Scheme for energy-efficient equipment and appliances” introduced stakeholders to the R3E Project, particularly the Labelling Scheme – why it is being undertaken and the various requirements of the scheme; introduced the proposed energy labels and most importantly to answer any queries and note any feedback received regarding the scheme. The R3E Project is being funded through a 1 million Euro investment by the Federal Ministry for Economic Cooperation and Development, Federal Republic of Germany (BMZ), and administered by the German National Metrology Institute (PTB). Implementation is by the CARICOM Regional Organisation for Standards & Quality (CROSQ) Network, led by the CROSQ Secretariat and the Dominican Institute for Quality (INDOCAL) of the Dominican Republic. 1) Support of regional standardisation activities for this sector, and use of these activities for the creation of binding directives and technical regulations. 3) Awareness-raising, informational and public relations activities, as well as dialogue with persons in decision-making and multiplier positions. In Component 1, the intended result is the adoption of relevant international standards, and adapting them to the Caribbean context where necessary. It has included the development of Minimum Energy Performance Standards (MEPs) for Buildings; compact fluorescent lamps (CFLs) and light emitting diodes (LEDs); refrigerators; and air conditioners; with future plans for solar photovoltaics and solar water heaters, as well as electric pumps. These MEPs for lights, refrigeration and air conditioners are inclusive of labelling requirements for the appliances in question. Component 2 has seen the introduction or expansion of testing infrastructure for lights, and refrigeration and air conditioning in Trinidad and Tobago and Jamaica respectively, through various projects and initiatives, as well as the training of requisite staff in the implementation of the testing requirements of the standard for the appliances. Component 3, the awareness component is about to kick off with sensitization sessions for the labelling scheme for appliances in the piloting and testing countries, beginning in October 2018 and running through the remainder of 2018 into 2019. The labelling scheme encompasses both the application/ implementation of the standards as well as the application of requisite testing for the appliances, is being implemented on a pilot test basis in the first instance with lessons learnt from the pilot phase being adapted and applied across the region. Belize is one of three piloting countries selected based on its willingness to implement as well as its suitability as a study for the pilot. The scheme is planned to be officially launched in December 2018, and operate through to June 2019. The scheme will be introduced on a voluntary basis in the pilot countries with plans for an eventual mandatory implementation, based on national priorities and focus.